At last! Here is a series of children's adventure stories for Pagan, Wiccan and earth-centered families to share the wonder of the Wheel of the Year. There will be eight books (corresponding to Imbolc, the Spring Equinox/Ostara, Beltane, the Summer Solstice/Litha, Lammas/Lughnasadh, the Autumn Equinox/Mabon, Samhain/Halloween, the Winter Solstice/Yule), but these aren't books teaching about the holidays. They are a fun story about modern Pagan kids facing challenges and standing up for what they believe in. Available in paperback or for your Kindle! Eleven-year-old Shanna and eight-year-old Rye take on grown-up responsibilities when an accident leaves Momma unable to walk for several weeks. Sister and brother must work hard to save the family garden and cook meals. Then a massive hail storm looms. Shanna and the Goddess is the fourth book in the Children´s Wheel of the Year series. Here is a story about celebrating the Summer Solstice that brings the themes of maturity, empowerment and confidence to life. As Shanna and Rye accept responsibilities, they discover the self-confidence and inner strength that come from hard work. But the real test of their resolve comes when a hail storm threatens to destroy everything they have worked for. How can a couple of kids keep a storm from flattening their garden? Each earth-centered holiday has its own energy and meaning. Shanna and Rye’s Summer Solstice is a celebration of life and of courage. and the power of kids to make a difference in our world. Eleven-year-old Shanna finds a secret pool on a class field trip to the “waste land” near her new school. The land nearby is dry and covered with scrub brush, but in a hidden pocket there is a wild profusion of flowers, trees and life around a trickle of water. Shanna’s teacher says the waste land is scheduled to be bulldozed for a building project and the tiny spring will be destroyed. But Shanna discovers something amazing that few outside her goddess-oriented family would believe—a magical protector of the spring, maybe even a real fairy. 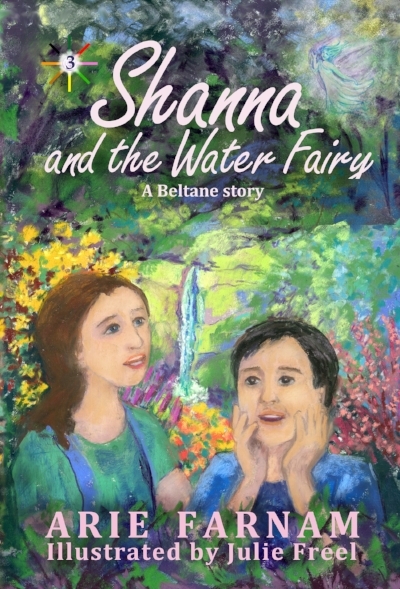 Shanna and her eight-year-old brother Rye decide they have to do something to save the spring and its magical resident. Amid a sharing of the festival of Beltane, the kids learn how passion and action can blossom to make positive change. This story is partly based on events from the author’s childhood, involving an endangered spring in dry country. But it is also an integral part of the Children’s Wheel of the Year, a collection of stories about the adventures of Shanna and Rye which make the concepts and themes of seasonal celebration come alive for children. available in paperback edition and as a Kindle ebook HERE! Cover reveal: Here is the beautiful cover with art by julie freel! available as a Kindle ebook and in paperback HERE! The yellow school bus slowed at the corner of Juniper Road and made a gulping noise and a loud hiss when the door opened. Shanna swung her backpack on and nudged her little brother Rye to get him moving. “Bye, Shanna,” Skylar called, flashing her freckly grin. “Bye, Skylar!” Shanna made a fist and swiftly touched her knuckles to Skylar’s for their friendship signal. They waved to the driver and the bus pulled out. Skylar’s face was pressed up against the glass and she stuck out her tongue at Rye. He laughed and did a silly dance at the side of the road until he dropped his backpack. “Come on,” Shanna said, pulling her coat tighter around her shoulders against the winter cold. She was already standing on the gravel road to Mrs. Pruce’s house. Now that Shanna was ten and Rye was seven, Momma had to work longer hours. That was why they had to go to Mrs. Pruce’s after school. Mrs. Pruce gave off old-lady smells. But she had nice cats. Momma always told Shanna and Rye that they had to respect her because she was “an elder” and she knew a lot. Rye picked his backpack out of the frozen slush at the edge of the road. But then a big blue pickup was coming slowly up the road toward him. Rye turned around to see who was driving. The kids knew just about everyone on this road. Shanna saw that the window on the driver’s side was already down. The pickup rolled to a stop right by Rye and there was a man and a teenager inside that Shanna didn’t recognize. “Rye Silver.” Rye stood his ground, even though Shanna felt like stepping back. There was no obvious reason for Shanna to feel nervous. The man in the truck wore an ironed red shirt and his brown hair was combed back neatly. But she had an uneasy feeling. The man had a big, warm smile, but it didn’t match his eyes. They looked like shark eyes instead of warm, friendly eyes, Shanna thought. And his voice went up and down in a sing-song, as if he was trying to lure a kitten out from under the couch. Shanna realized that the sing-songy man hadn’t told Rye his name. And for some reason she didn’t really want to tell them her name. He was grinning and laughing, trying to joke, but Shanna didn’t think it was funny. Her heart started beating faster and she felt clammy inside her coat. She stepped toward Rye and he looked at her. His eyes were big and confused. Shanna reached him in a few steps and he took her hand. The man shrugged. “Nice to meet you too, missy.” But his flat shark-like eyes didn’t look like he was glad to meet her at all. The pickup pulled away and the two kids started walking up the road toward Mrs. Pruce’s. “He didn’t mean our kind of witches, did he?” Rye asked after a minute. Rye shrugged but didn’t say anything else. The light was already shining out of Mrs. Pruce’s kitchen window because it was still deep winter. Crusty snow lay in patches by the sides of the road and Shanna thought she could smell more coming. Momma had taught her to smell snow—a sharp, dry smell that somehow reminded Shanna of the dentist’s office. It was already dark under the big pine trees by the road. When they got close to them Rye suddenly yelled and jumped back, bumping right into Shanna. “Hey, what are you doing?” she snapped. Her knees were bruised from him whacking them. “There’s something in the trees.” Rye whispered, sounding scared—a lot more scared than he’d been with that man asking him questions. Shanna pulled Rye over to the other side of the gravel road. But he walked backward and kept staring. Shanna turned around. The hollow underneath the pines was dark. She couldn’t see anything there, but she felt shivery all over again. Then something moved in the darkness or maybe just the darkness moved. Rye watched with his teeth bared, like a tough little wolf puppy. Shanna swallowed. It was creepy. She jerked her head around. On the branch of a leafless plum tree just above their heads, a large black bird sat looking down at her with one beady eye. It cocked its head and then burst upward, flying away. When Shanna looked back the darkness under the pines was just a regular old shadow again. She shivered in her winter coat and tugged at Rye to hurry up. When Momma got there an hour later and drove them the two miles to their house, Shanna told her about the black bird. Momma’s eyes crinkled up with little question marks in the corners. 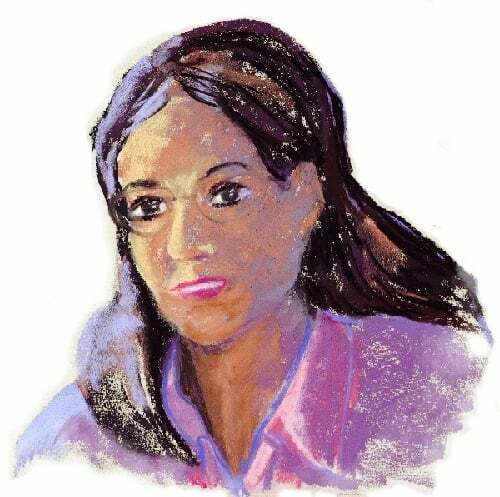 “If she was a messenger, I don’t know what she said,” Shanna grumbled. Momma often talked about spirits and what animals or signs could tell you. Shanna knew some people don’t believe in things like that, but she felt the truth of them. Momma wasn’t into silly tricks. Her kind of magic was as warm as a candle flame and as beautiful as the night sky full of stars. “The bird told us to go to Mrs. Pruce’s house and told the mean thing under the trees to leave us alone.” Rye sounded sure of his feeling. “Really?” Momma smiled at him in the rearview mirror and Rye grinned back. “If the bird was telling us to be careful of something, it was probably that creepy man,” Shanna said. “What creepy man?” Momma asked. “Why not?” Momma sounded interested. Shanna wondered if Momma would scold her for saying she didn’t like a new neighbor. Momma was always friendly to neighbors. “Like when it seemed like I could never pass that spelling test, but I knew I could, so I kept trying,” Rye said. “Yes, like that too,” Momma said. To get the full story see this link for the Kindle ebook and the paperback editions. You are invited to join my heart-side email circle. This is an intimate group of readers who receive a kind of virtual cup of tea along with my new links to books and blogs each week. There is no spam whatsoever and no one else will ever get your address.